You're going to be AMAZED at the things you can make and do. These are stunning projects that will leave jaws dropping and eyes popping! And you can make these impressive works of art with your own hands! Finally, A Hobby That Allows You To Tap Into Your Creative Skills And To Create Things Of Beauty At Friendly Prices! We all have a creative side. It's part of being human. We long to create. We want to add beauty to the world. The urge to follow that creative instinct led the first cave people to scribble on walls. It put Picasso in front of the canvas. It built the Taj Mahal. That need to be creative stares back at you from every Monet, tickles your ears with every great piece of music and captivates you in pieces of great literature. It's a core human need. It's a compulsion. You feel it. We all do. * But maybe you can't paint. * Maybe you can't play guitar or paint a song. * You may not have a way with words. * You can't imagine turning a block of stone into a sculpture. And, quite frankly, you can't even conceive of spending years and years to perfect those skills--or of spending thousands and thousands of dollars along the way on lessons and equipments. Wouldn't it be nice if there was a creative outlet for you that would produce fantastic, tangible results without breaking your budget? Paper-based craft projects may be exactly what you need to fulfill your creative instincts without the time, hassles and expenses associated with other options. You can learn how to make amazing items--the kind of things at which you an others will marvel--without spending decades learning the ropes. What if I told you that you could be doing these things almost instantly? Oh, and what if told you that all of that was possible at prices that are more than recession-friendly? Well, it's all true. You can do all of that. It isn't a simple "idea book". It's a real road map for creating amazing works of art with your own two hands. Paper Crafts for Grown Ups contains step-by-step instructions for a number of amazing projects. You'll be able to experience immediate artistic success while developing the skills that are sure to lead you to other amazing ideas of your own. 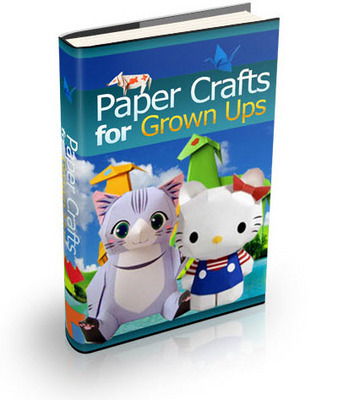 Paper Crafts for Grown Ups is stuffed with projects and with photo illustrations to guide you through the process. It's a fantastic way to start flexing your creative muscle. Today is a great day to start tapping into your creative energies! If you've been looking for an opportunity to explore your creativity and artistic gifts, this is the perfect way to do it. Claim your copy of this one-of-a-kind resource right away!